« The Day or The Way? I can’t seem to find the balance between good audio in the church and a good audio recording. I’ve had one or the other, but can’t seem to get both. Any A/V geeks out there can help? What comes to your mind when you think of a savior? Superman comes to my mind. Faster than a speeding bullet, more powerful than a locomotive, and able to leap tall buildings in a single bound.” It might be a last minute nail-bitter, but at the end of the day Superman always saves the damsel in distress, or the innocent children in peril. He is unstoppable, bulletproof, and he conquers the bad guys – puts them in their place. Sure there kryptonite, but that’s only temporary. Superman, as a savior comes out unscathed, righteous, an example of good triumphs over evil. Is this the kind of savior we have in Jesus Christ? Jesus began to teach them… Jesus has been doing quite a bit of teaching up to this point in Mark’s Gospel. We don’t have the sermon on the mount in this Gospel, but there is still plenty of parables. On his travels Jesus often made it a point to enter the synagogue and teach. And there were plenty of private teaching opportunities when Jesus was alone with his disciples. He taught about the kingdom of God. But now, he began to teach them something new – that the Son of Man must suffer, be rejected, and be killed. This time there are no parables, there is no promise to keep this a secret, he spoke plainly. Our Gospel reading today is the first time that Jesus predicts his death, the first time that his disciples heard that Jesus must die, and well Peter doesn’t take it too well. We read that Peter rebuked Jesus. That’s simple something a disciple ought to do to the Messiah, the son of Man. We do need to give Peter some credit though; it was a rebuke out of love. He heard here for the first time that this Jesus that he loved, that he gave up a job, family, friends, safety, he gave up so much for this man he rightly believed to be The Messiah – and he just heard that his Messiah will die! It was a natural, heartfelt, loving rebuke – Say it isn’t so, you don’t have to die, you shouldn’t die, you are the Messiah! In fact, the verses immediately before our reading, we discover Peter making the first confession that Jesus is the Messiah. Jesus asked his disciples “Who do people say I am?” And they gave various answers: Elijah, John the Baptist, a prophet. “But who do you say I am?” And Peter was the first to say “You are the Messiah.” Peter was right about who Jesus was, but it would turn out, Peter was wrong about what that meant. I imagine that Peter had a superman kind of view of what the Messiah should be. The Messiah was going to come in, kick out the treacherous Roman occupiers with a heavy hand and rebuild the nation of Israel to the glory days it once knew all with power, force, and the sword if necessary This kind of savior would need power and might. That kind of savior certainly could not be killed at the hands of the people he was going to save people from! Peter expected a superman kind of savior and he got Clark Kent. He expected warrior and got victim. He expected relief and got sacrifice. Everything Peter believed about his Messiah was dashed by this new teaching of Jesus. So naturally, Peter pulls Jesus aside and double checks – I think you are mistaken about what it means to be savior Messiah can’t possibly mean death, can it? Surely you don’t have to die. And here is where Jesus stopped Peter short, interrupted him. Rebuked his rebuke. Peter, you couldn’t be more wrong. In fact Jesus calls Peter Satan! Awfully harsh, isn’t it? But when you think of it, Peter is offering a temptation to Christ. There are three times when Jesus faces significant temptation in his life – later in the garden of gethsemane when he prays that the cup of suffering can pass him by, and yet he prays for his father’s will and not his will, this episode with the rebuke from Peter, and Jesus’ time in the wilderness. Recall that time in the wilderness – Each of the temptations that Satan offered was a short-cut to Jesus’ goal of kingdom; but it was a short-cut without suffering. Turns these stones into bread, leap from the steeple and show that the angels will save you; bow down to me and this whole world will be yours. The temptation was do these simple things to get your kingdom as Christ, and avoid the cross. Jesus said “be gone Satan!” The cross is essential to the work of Christ. Jesus’ rebuke of Peter is harsh, but it is true – Peter suggested a Messiah without suffering, he offered the temptation to avoid the cross just like Satan did in the wilderness; and Jesus rebuked this notion because a death on the cross is the ultimate act that Jesus came to do. It can be difficult for us to realize the scandal of the cross in our modern day. The symbol is everywhere, it has been domesticated to some extent. How many crosses can you spot in this worship space? On our altar, here on the pulpit, various stained glass scenes. Count the crosses you see this week when you go about your daily life. When you see the cross, does it make you cringe? It was a torture device, the government put people on that wood to kill them – it is absolutely scandalous. We might still have that sense of scandal if that instrument of execution was still used today. Imagine if, instead of a cross on our altar, a noose hung in the chancel. That would be awfully erie, uncomfortable,….just wrong. That is the cross. Total scandal. That the God of the universe, the Messiah, would die in such a way at the hands of the government What kind of savior dies? How many people can he save if he can’t save himself? It would seem that Jesus came not to relieve suffering, he came to endure it. And…he turns to the crowd along with his disciples and said “Whoever wants to be my disciple must deny themselves and take up their cross and follow me.” Carry your cross. What could that mean? In Jesus’ day, carrying the cross literally meant carrying the piece of wood that served as the cross beam, carrying it to the place of execution. Carrying it through the streets to face the mocking and jeers of the onlookers. If you were not the condemned, carrying the cross meant associating yourself with them and welcoming the insults meant for the one who was facing death. Publicly identifying with the condemned. Certainly, we just simply do not face the same risks here that other Christians do – being a Christian in not a crime where we live (but it is in many parts of the world); and yet, even for us, being religious does come with risk. What will people think of me? Won’t they think I’m some sort of religious nut if I talk about my faith openly? I think of the man on East Market Street in Harrisonburg. Have you seen him? He stands at the traffic light just outside of WalMart. He literally carries his cross. He holds it up, rain or shine, and waves at people as they drive by. By his action he is publicly identifying with Jesus. I wonder what comments he gets, what do people think? He’s crazy; what a waste of time; lazy; weirdo! I bet he faces ridicule to publicly testify about the cross in our modern day; sacrificing an afternoon to do so. What does it mean for you to carry your cross? What does being a disciple cost us these days? How would you deny yourself, what would you give for the sake of the Gospel? Jesus, our Savior, suffered, was rejected, and died. He called to the crowd and to his disciples – if you want to be my disciple, follow me. This Lutheran is quite pleased that you are preaching the Cross. Keep it up, brother. 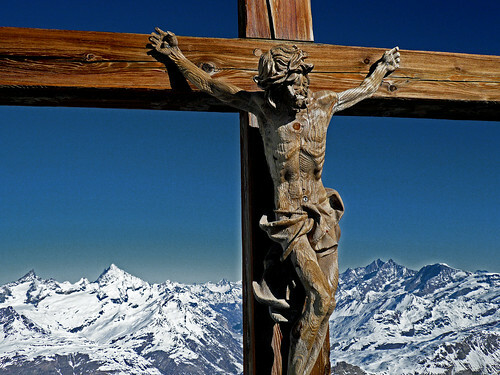 By the way, where is that fantastic crucifix pictured at the beginning? The caption on Flickr says its atop Klein Matterhorn in Zermatt, Switzerland. Thanks for the encouragement!